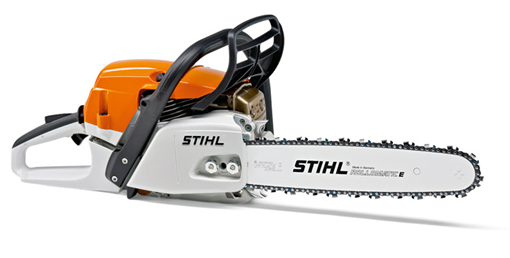 The Stihl MS 261 C-M Professional Chainsaw is a strong all-rounder featuring Stihl's innovative 2-Mix technology. 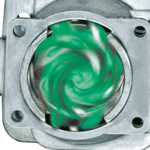 Reducing the amount of fuel consumed and the amount of emissions produced. 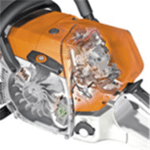 Equipped with a HD2 air filter for longer life span in-between maintenance runs, while also being manufactured with Stihl's M-TRONIC electronic engine management system. This new system allows the saw to automatically adjust to the conditions after a few cuts. 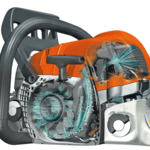 Factors taken into account by the saw are varying fuel grades, altitude and temperature so the saw can perform at its optimum capacity all the time. Taking quality and innovation in a saw to the next level. The bar nuts are held captive to the sprocket cover, so you can't lose them when change the bar, chain etc. Although if you loose the sprocket cover this feature won't be much help to you! This innovative technology is one small step for man, and one giant step for mankind! The fully electronic engine management system adjusts ignition timing and fuel metering in all operating models. The saw during the first few cuts will take into consideration conditions such as the altitude, fuel quality and temperature in order to produce the most efficient cut at the time. 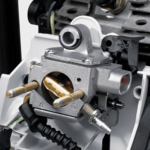 It also makes manual carby adjustments unnecessary as the electronic start recognition can determine whether the saw is starting from cold or warm meaning there is no choke and just one starting position. The M-Tronic technology can also remember previous conditions so if it is used in the same scenario again it will automatically be at optimal performance from the first cut. The long life air filter system has a service life of up to five times longer than the previous air filter system. The innovative HD2 filter is manufactured from a water and oil repellent polyethylene filter material. Consisting of up to 70% finer pores than fleece and is substantially easier to clean. Meaning more cutting can be done in between maintenance on your machine.